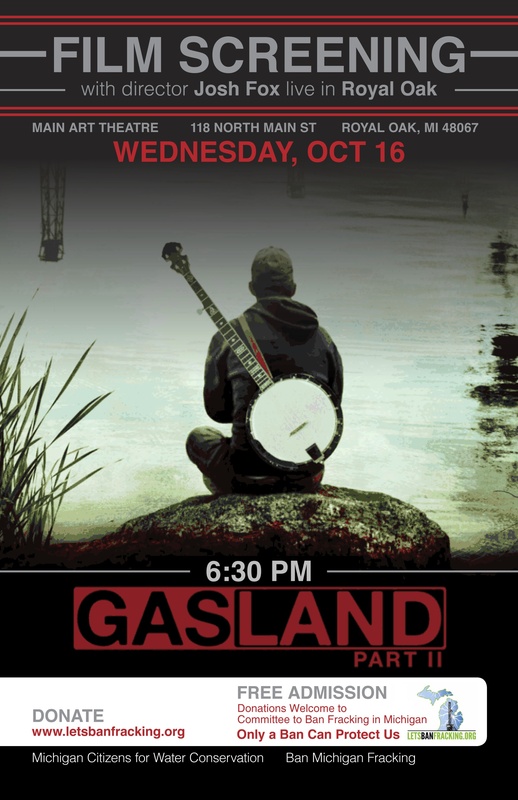 Ban Michigan Fracking is pleased to co-host a free screening of the film Gasland Part II, with special guest filmmaker Josh Fox who will join us for the evening for an question and answer session after the showing. There are no reserve tickets. Please come early and line up outside the theatre. First come, first serve, but Committee to Ban Fracking circulators will have a reserve section up front. Donations to Committee to Ban Fracking in Michigan, the ballot initiative, will be welcome at the door, and online at: www.letsbanfracking.org. Graph from the Pew Research Center report, September 4-8, 2013. No wonder the industry is sweating it. The more people learn about fracking, the more they oppose it. And today, more Americans (49%) oppose increased use of fracking than favor it (44%). That was just one of the findings released by the Pew Research Center, who conducted polls in March 2013 and September 2013. “Since March, opposition to increased fracking has grown significantly across most regions and demographic groups,” the Center reported. Back in March, support for fracking exceeded opposition by 10 points (48 to 38%). 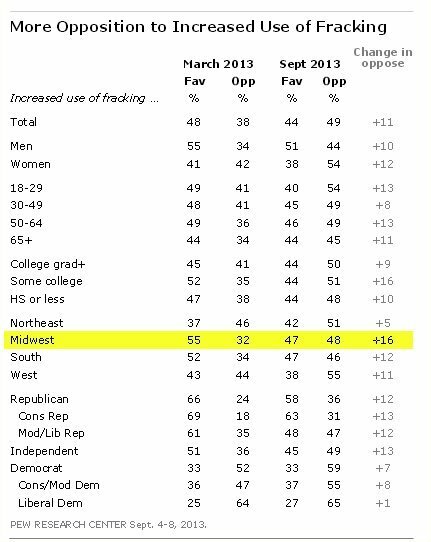 The most significant finding to us at Ban Michigan Fracking is that in the Midwest 32 % opposed fracking, and that rose 16 points to now 48% of Midwest people opposing fracking in September 2013, (while 47% favor it). That is a huge shift in public opinion. In the same six-month period, hundreds of volunteers with Committee to Ban Fracking in Michigan have been throughout the state, collecting signatures from Michigan voters on ballot initiative petitions to ban fracking and frack wastes. At all meetings held by the DEQ or DNR, the Committee to Ban Fracking in Michigan petitioners were there, clipboards in hand. At county fairs, farmers markets, art festivals, musical concerts, sporting events, picnics, and parades, the Committee to Ban Fracking has taken the ban message and the direct democracy approach to banning fracking. Word seems to be getting out.